AidP, a novel N-Acyl Homoserine Lactonase gene from Antarctic Planococcus sp. The Southern Ocean: Source and sink? High divergence across the whole mitochondrial genome in the “pan-Antarctic” springtail Friesea grisea: Evidence for cryptic species? 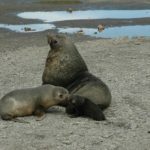 Evolution of the Antarctic marine fauna: what can DNA and fossils tell us?